Our journey here is aligned very closely to our mission and vision. It's about getting organisational results with people, that benefits not only it's external customers, the community as a whole but provides a supportive environment for it's staff that allows them to grow and flourish. It's a simple proposition, but often complex to deliver, especially without focus. In this info-graphic we see the main HR DELIVERY MODEL to create a successful HR function for the future where information and technology are the building blocks of stakeholder integrated decision making. Against a backdrop of contextual global understanding and deep internal capability insight, fully integrated with organisational values and goals, this can only lead to incredible added value and great organisational partnerships. How do you make it happen? What do you skills do you need? Delivery of results requires a confident, focused professional consummate with both the technical and business skill sets and knowledge pools required to impress key stakeholders. 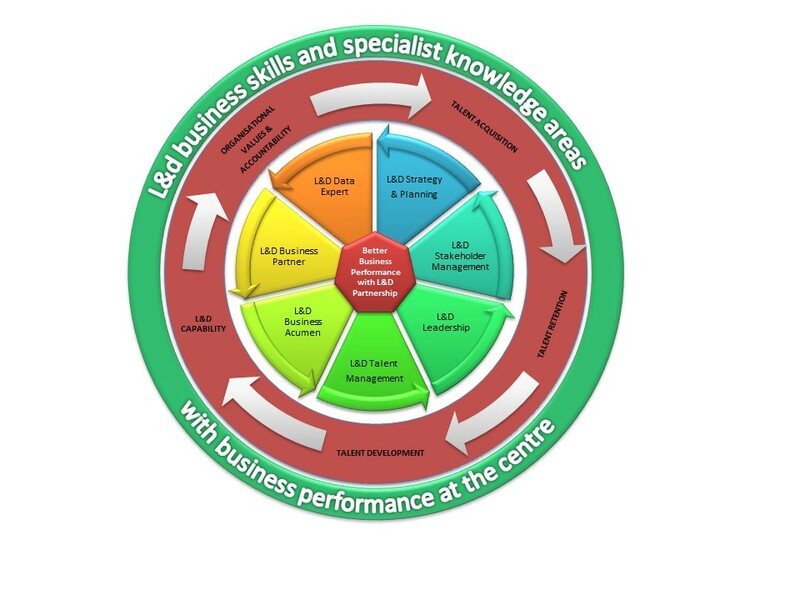 Our model below shows the key areas of competence for an HR professional, the L&D models are further below. Why develop yourself or your team? Change brings challenges. Fast paced change brings BIGGER challenges. To equip yourself with the right tools, attitude and skill sets to get to grips with everything that is thrown at you can be a major hurdle, yet it is possible to be ready and build a great 'A' TEAM. This means, HR and L&D has a massive role to play in organisational effectiveness. So slick processes combined with an innovative approach and adaptability to change but with focused action is achievable if you have enagaged capable people. Diminish that you kill the result at the end of the equation. All this is driven by effective LEADERSHIP. This is why HR and Learning functions can have a major impact on organisational effectiveness simply by the quality of the managers and leaders they employ and develop. For what they bring to the table and the difference they make. Here is the list of currently available masterclasses that have been designed to help you achieve those goals. We have a competency circle and career journey map which can guide you to all sorts of development opportunities, whatever your learning style.